The White House Initiative on Asian Americans and Pacific Islanders is pleased to announce new supporters and commitments to its “Act To Change” campaign. Every day, kids of all ages suffer from being bullied in schools across the country. In the Asian American and Pacific Islander (AAPI) community, this problem is often compounded by cultural, religious, and linguistic barriers that can keep AAPI youth from seeking and receiving help. 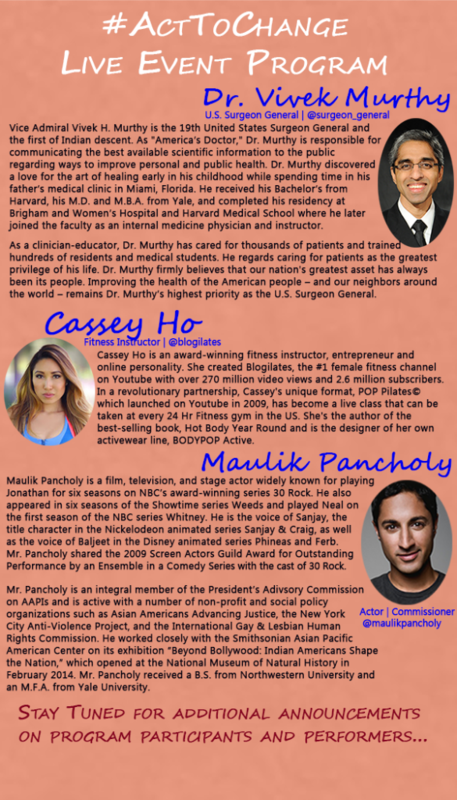 On October 15, 2015, the White House Initiative on AAPIs, in partnership with the Sikh Coalition and the Coalition of Asian Pacifics in Entertainment, launched “Act To Change,” a public awareness campaign to address bullying, including in the AAPI community. AdCouncil: As part of its “I Am A Witness” Bullying Prevention, AdCouncil is teaming up with #ActToChange to address youth bullying and encourage peer empowerment in the social and digital media space. AdCouncil will be capturing photos and videos of the event via their Snapchat account “ISeeBullying” on November 21 to document the Live Event in Los Angeles and share the #ActToChange message with its Snapchat followers. In addition, AdCouncil is sharing #ActToChange multi-language infographics and resources on its “I Am a Witness” website and cross-posting #ActToChange on their social media platforms. Amazin LeThi Foundation: In support of #ActToChange, the Amazin LeThi Foundation will host an event in 2016 focusing on anti-bullying and LGBT athletic equality, and will support the campaign on its social media platforms. Bodybuilder, HIV advocate, and Athlete Ally Global Ambassador Amazin LeThi will provide video content sharing her personal experiences about bullying. Asian Cinevision: Asian Cinevision will support the campaign on its social media platforms as well as their weekly e-bulletin the week of the live event. mydiveo: mydiveo created a video vignette featuring popular artists including YouTube stars AJ Rafael, Timothy DeLaGhetto, MC Jin, Dia Frampton from The Voice, Andrew Garcia, and Travis Atreo pledging to #ActToChange. The video is featured at mydiveo.com/acttochange. Teach For America: Teach For America will develop a blog campaign to elevate the voices of both teachers and former educators who have dealt with bullying, including bullying of AAPI students, in their classrooms. Tyler Clementi Foundation: In continuing its effort to address cyber-bullying and the suicide of LGBT youth, the Tyler Clementi Foundation will support #ActToChange on its various social media platforms. The Foundation, in collaboration with New York Law School, recently launched the Tyler Clementi Institute for Internet Safety, a first-of-its-kind direct service litigation clinic to help victims of cyberbullying and harassment for free. In addition to being a pro bono clinic, the Institute will hold conferences, workshops, and host a hotline where victims can learn about their rights and seek justice. YMCA of the USA: YMCA of the USA will provide “Act To Change” content to Ys across the United States to build awareness and encourage participation in the campaign. In addition, YMCA of the USA will develop a blog campaign to identify youth who may be interested in sharing their bullying experiences. The White House Initiative on AAPIs, co-chaired by Education Secretary Arne Duncan and Surgeon General of the United States Dr. Vivek Murthy, is housed within the U.S. Department of Education. Growing up I was taught that a girl or a woman could not have an opinion, a dream, or a voice. Instead, in my Indian household, with a “traditional man-woman dynamic,” pushing the ugly under the rug and pretending life is rainbows and unicorns was the prevailing norm. Expressing any other opinion had consequences. Physical ones. My struggle to raise my voice started when I was four, coaxed by the dream of one day being a television anchor. All attempts by my parents to bully it out of me nearly broke me. But I held on to my dreams, and I followed my voice. I broke ranks with my parents when I turned 18. I paid for college myself, went on to graduate school, and paid for every move from Pennsylvania, to Washington, DC, to Boston, to New York to Wyoming, and back again to make my journalism dreams come true. Today, I helm a robust women’s networking initiative in New York City called LadyDrinks. It works to champion the South Asian female entrepreneur or professional. Each day, I highlight one member or attendee of my events, and I encourage all of them to share their stories. I remind them to believe in their voice and to speak it loud and speak it proud. To have an opinion, even if it’s not a popular one. Our stories can be shared experiences or unique ones, but they are all of value. Women have shared about parents who have attempted to take their own lives when the immigrant life got to be too much; of taking on extra jobs to support a child who is challenged or handicapped; of taking trips abroad – alone – when the recession claimed their last job. Next May, a contingent of my ladies head to India to speak at the Women’s Economic Forum in Delhi. Our voices will speak to the growing population of women in India who are working, and about how we have stood up as women and realized our dreams of becoming entrepreneurs, sports medicine doctors, and Chief Transformation Officers at nonprofits. There is a demographic of women that have been held underfoot by the expectations of in-laws, parents, and society. No more. This exchange of dialogue is needed now more than ever. LadyDrinks aims to pay it forward and pave the way for the next generation of South Asian girls to stand up. Joya Dass was one of the first South Asian females to be seen on mainstream television in the US. She’s been a business anchor for major networks for the last 15 years, including CNN, ABC and Bloomberg. She can currently be seen delivering live hourly reports from the floor of the New York Stock Exchange for NY1 News and CBS. Since December 2002, she has also been the host of the weekend morning entertainment show AVS, catering to the first and second generation Indian living in the US and wanting their Saturday morning Bollywood Fix. Joya also helms a robust women’s networking initiative in New York City called LadyDrinks, which hosts monthly events to connect South Asian female entrepreneurs and professionals. Bullying is targeted aggression or hurtful behavior towards someone that’s aimed at creating a sense of isolation. This blog post is part of ActToChange.org’s features of voices against bullying. “Act To Change” is a public awareness campaign to address bullying, including in the Asian American and Pacific Islander (AAPI) community. Tune in to our LIVE EVENT on Saturday, November 21, 2015, in Los Angeles, CA. We will be live-tweeting (@WhiteHouseAAPI) and live broadcasting through Persicope (@WhiteHouseAAPI) and Snapchat (@ISeeBullying).